In the past two days Kiev’s forces have launched several short-range ballistic missiles into areas in east Ukraine controlled by self-defense forces, CNN reports, citing US government sources. The move “marks a major escalation” in the Ukrainian crisis, CNN said. 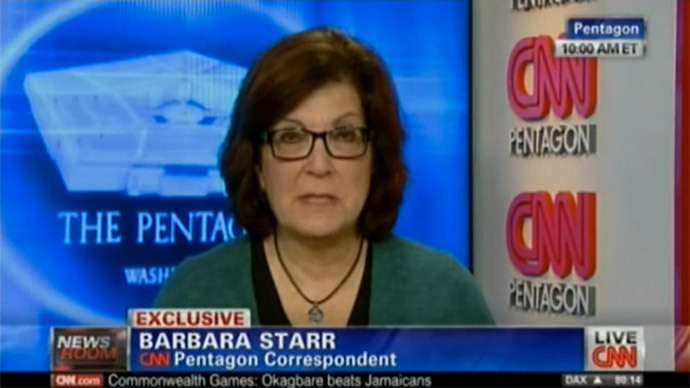 “Three US officials confirmed to me a short time ago that US intelligence over the last 48 hours has monitored the firing of several short-range ballistic missiles from territory controlled by Ukraine government forces into areas controlled by the pro-Russian separatists,” Barbara Starr, CNN’s Pentagon correspondent, said in a live report. Short-range ballistic missiles can carry warheads of up to 1,000 pounds (450 kg) and are capable of killing dozens of people at a time, Starr said. A Moscow correspondent for another American television network, ABC, tweeted Tuesday that the Kiev forces fired three ballistic missiles at self-defense forces near the town of Snezhnoe (Snizhne in Ukrainian) in the Donetsk Region. According to Kirit Radia, this is what a US official told ABC’s Pentagon digital journalist Luis Martinez. Radia added that according to the official, it is likely that Ukrainian forces use such missiles since they do not want to risk their planes being shot down by sending them to the area. The CNN gave no details regarding the exact missiles’ launch and impact point. “In fact, the US is holding this information right now fairly tightly, officials say, because they are in an awkward position: these are, you know, the so-called ‘good guys’ firing ballistic missiles, Ukraine government forces,” Starr said on air. So far, there has been no official reaction from Kiev and Moscow. The question now is how Washington – which has strongly backed the Kiev government – will comment on the revelations, CNN’s correspondent said. 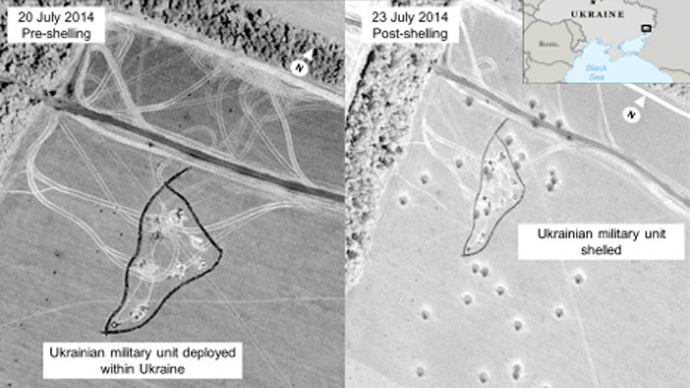 “Will we see the satellite imagery of the Ukrainians firing against the separatists? That may be a very tricky political question for the US intelligence community today,” CNN’s Starr said. However, CNN’s correspondent in Donetsk, Nick Paton Walsh, said he had heard nothing of ballistic launches in the area and nothing of that kind has been openly discussed. He added, though, that it is no secret that both sides of the conflict were using “very heavy weaponry” against each other. Russian military experts say that if the Ukrainian military did use ballistic missiles, most likely they would be Tochka-U (NATO Designation SS-21 Scarab). Viktor Murakhovsky told RT that the military possibly used the missile against a fixed target, such as the militia’s staff headquarters. “I’m talking about the Tochka-U tactical ballistic missile on a wheeled chassis, which the Ukrainian army has in its arsenal. It’s a Soviet-designed and produced missile. It may have a high-explosive fragmentation warhead or a disintegrating warhead,” Murakhovsky said. Anatoly Tsyganok, the head of the Military Forecasting Center in Moscow, agreed that the Ukrainian army could have used the Tochka-U missile. The news broke amid growing tensions between Washington and Moscow over the ongoing violent confrontation in Ukraine. The US, giving strong backing to the Kiev government, has repeatedly accused Russia of supporting anti-government forces in east Ukraine and supplying them with arms – an accusation Russia has strongly denied. 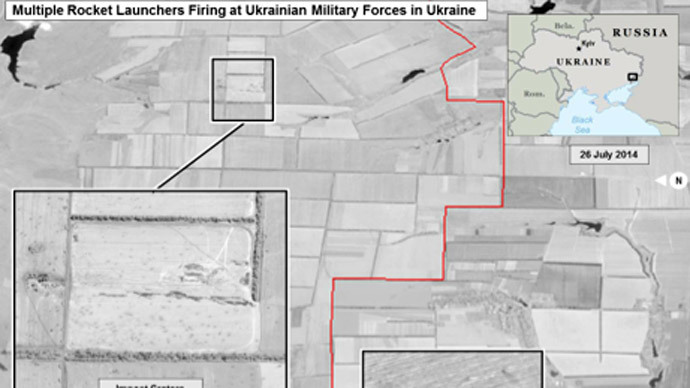 Last week, US government officials claimed that Russia was firing artillery across the border into Ukrainian territory, but refused to provide any hard evidence besides some pictures captured by a civilian satellite, which were rebuffed by Russia’s Defense Ministry. So far the US has failed to back its statements with any trustworthy proof, mainly referring to some images, “commons sense” and social media. Charges and counter charges between the two powers have been boiling following the tragic accident with Malaysian Airlines Boeing-777 that crashed in Ukraine on July 17. The very next day after the incident, long before experts arrived at the scene and a probe was launched, President Barack Obama said that America had “increasing confidence” that the plane was shot down by a surface-to-air missile that was launched from militia-controlled territory. US intelligence said later that it found no direct link between Russia and the plane disaster. But, still, the blame-game continued with Russia being accused of “creating conditions” that led to the incident. A fresh bunch of accusations were thrown at Moscow on Tuesday, with Obama stating that Russia was not cooperating with the international investigation of the plane crash. Russia on the contrary has been calling for a transparent and impartial investigation of the tragedy from the very beginning. Russia’s Defense Ministry presented its own evidence on the movements of Ukrainian military before and after the tragedy, including surface-to-air missile systems, and a fighter jet that had been tracking the civilian aircraft. During the press conference, Russian military posed a number of questions to Kiev and Washington answers to which could shed light on what really happened on that day and help the international investigation. Those questions however were left unanswered with western media and politicians instead blaming Russia of not willing to use its “influence” on anti-Kiev forces whom they accused of hampering the investigation despite the fact that it was Kiev’s forces who intensified the military operation in the direct vicinity of the crash site. On Tuesday however, Ukraine’s President Petro Poroshenko finally said that Kiev is ready for a cease-fire at the MH17 crash site, as was demanded by the UN Security Council resolution on July 21. The local militia in the meantime confirmed they were ready to further cooperate with international experts investigating the crash.